Topotable focuses on the gap between the demand for generic exhibition spaces and exuberant and complex geometries made available. The quest for generic spaces – often labelled “White Cubes” – against which to display works of art is at odd with the complexity of digitally-generated design which requires immersive conditions and flexibility requiring a rethinking of the relation between the displayed object and the exhibition environment. 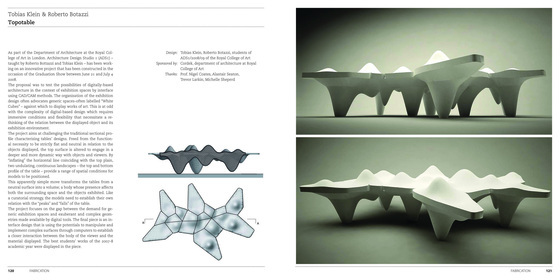 The project aims at challenging the traditional sectional profile characterising tables’ designs. Freed from the functional necessity to be strictly flat and neutral in relation to the objects displayed, the top surface is altered to engage in a deeper and more dynamic way with objects and viewers. 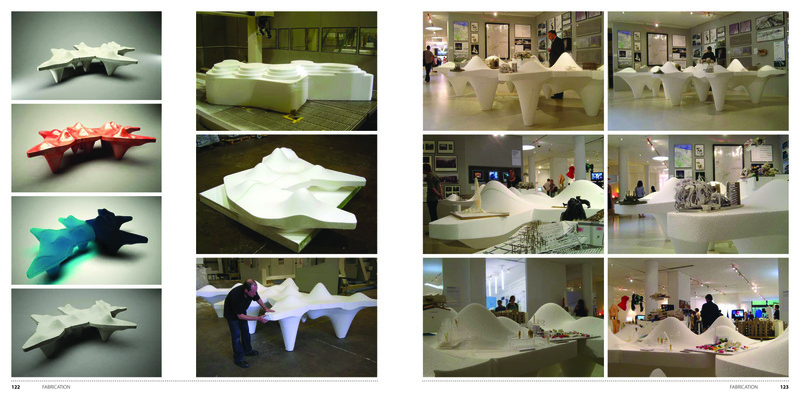 By “inflating” the horizontal line coinciding with the top plain, two undulating, continuous landscapes – the top and bottom profile of the table – provide a range of spatial conditions for models to be positioned. This apparently simple move transforms the tables from a neutral surface into a volume; a body whose presence affects both the surrounding space and the objects exhibited. 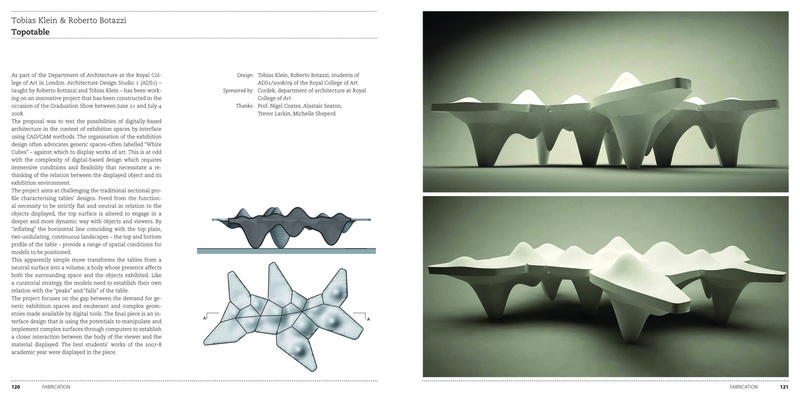 Like a curatorial strategy, the models need to establish their own relation with the “peaks” and “falls” of the table. The final piece is an interface design that is using the potentials to manipulate and implement complex surfaces through computers to establish a closer interaction between the body of the viewer and the material displayed.